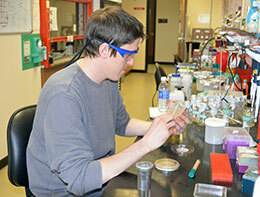 Chris Vassallo, a UW doctoral student in the Department of Molecular Biology, performs routine maintenance of bacterial cultures in the lab. Vassallo was lead author of a paper about cell rejuvenation that was published in PNAS May 18. Wall was the senior and corresponding author on a paper, titled “Cell Rejuvenation and Social Behaviors Promoted by LPS Exchange in Myxobacteria” that was published in the May 18 online issue of the Proceedings of the National Academy of Sciences (PNAS). The journal is one of the world's most prestigious multidisciplinary scientific serials, with coverage spanning the biological, physical and social sciences. Pengbo Cao, a UW doctoral student in Molecular and Cellular Life Sciences (MCLS), and Darshankumar Pathak, a then-UW doctoral student (since graduated) in MCLS, were other UW researchers who contributed. David Zuckerman and Egbert Hoiczyk from the W. Harry Feinstone Department of Molecular Biology and Immunology at Johns Hopkins Bloomberg School of Public Health also contributed to the paper.